Teardowns are incredibly useful for learning what’s been tried before. Dave Jones is king of the teardowns in the sense that he not only takes a product apart, he also observes and explains the underlying importance of what we see during the teardown. 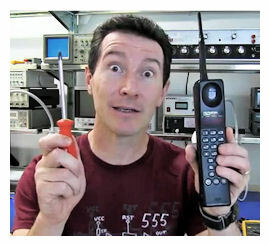 In this 30-minute video, Jones tears apart a vintage 1994 Motorola Ultra Sleek 9660 Dynatac analog mobile phone handset. During this process, he comments on a variety of evolving technologies including antennas, batteries, microphones and speakers, pcb layout, component selection, and so on. As the teardown progresses, you get a feel for how electronics design and packaging have changed over the last 18 years. You especially get that sort of perspective when Jones then tears down a Nokia GSM phone circa 2000—only six years newer—for comparison. One thing to note here is that Jones cannot help but look at the Motorola design with 21st century eyes. Back in 1994, there were at least two notable differences with today. First, the SoC had not yet arrived, so you bought your processors as separate ICs. The advent of the SoC has made a huge difference in system-level design. Second, surface-mount technology and packaging was still fairly new. The Motorola 9660 Dynatac is completely based on surface-mount components, and we’ve become well used to seeing boards that are entirely based on surface-mount assembly, but the technology just was not as common back when the Dynatac was designed. It’s easy to forget this, but a good electronics archaeologist needs to keep these eras well in mind. This entry was posted in EDA360, pcb, Silicon Realization, SoC, SoC Realization, System Realization and tagged Dave Jones, Dynatac, Motorola, Nokia. Bookmark the permalink.